The menu for the Bridal Breakfast that I catered included my Blueberry Crumb Coffee Cake, Brown Sugar Streusel Coffee Cake, Strata’s, Fruit Salad, juices, coffee, and Champagne. This is a wonderful coffee cake, the recipe is from my friend Debi from Recipes for My Boys. When I saw the cake I knew that it would be perfect for the bridal breakfast, such a delicious moist coffee cake. It was so fun to see the photographer take so many pictures of my cakes and strata’s. I can’t wait to see how the pictures came out. The Bride and Groom had a stellar weekend in Maine for their wedding. I wish them many years full of laughter and joy in their marriage. Beat in eggs one at a time. Set aside. In another mixing bowl, whisk together flour, baking soda, baking powder, and salt. Alternately, add flour mixture and sour cream, beginning and ending with flour mixture. Mix brown sugar, nuts, ground cinnamon and flour until incorporated. Stir in melted butter until crumbly. Add 1/3 streusel to the bottom of a greased bundt pan. Add half of the cake batter. Layer 1/3 streusel.Top with remaining batter. Bake in preheated oven for 50 minutes or until cake pulls away from pan, insert a toothpick in the middle of the cake, if it comes out clean, then the cake is done. Cool cake on a rack in pan 15 minutes. Run a plastic knife around edges several times, to make sure cake does not stick. Turn cake out onto cooling rack. WANT TO SEE MORE COFFEE CAKES? I hope that you enjoy my easy to follow video tutorial! I’ve been looking for a new coffee cake recipe. Can’t wait to try this. I’m thinking I’ll be adding some finely chopped apple to the batter. I’m in the middle of an epic battle here. I want to rush in the kitchen and make this (and the blueberry crumb coffee cake) but it’s just me at home alone for a few days, and I know exactly what would happen! Must.Wait.For.Menfolk. Found your blog via the linkup & I am so glad I did! Your site is lovely & I am now following. All these cake recipes look amazing – where should I start?! Netti, every one of your cakes looks scrumptious. I wish I baked, but then I’d have to eat them all. But sooo happy to have you share them at #theWeekendSocial. Hope to see you back Thursday 9:00 PM EST. Pinned! Love this wonderful recipe, Nettie! 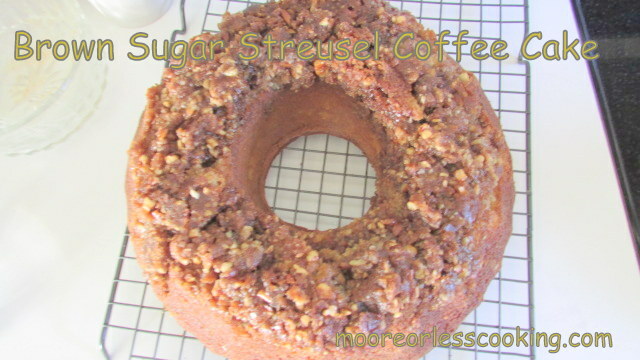 Your Brown Sugar Streusel Coffee Cake looks absolutely delectable! Love the other cakes too. I’m glad the Bridal Breakfast went so well – and that the wedding was lovely too! Thank you for sharing this tasty recipe with us at the Hearth and Soul hop. 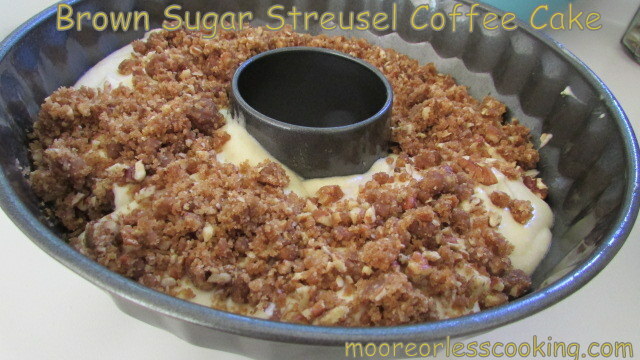 We will just love your Brown Sugar Streusel Coffee Cake, I would take a slice right now! Hope you are having a great day and thanks so much for sharing with Full Plate Thursday. Thanks for this great selection of coffee cake recipes. I love making them for weekend breakfasts. They all sound delicious. Wow! 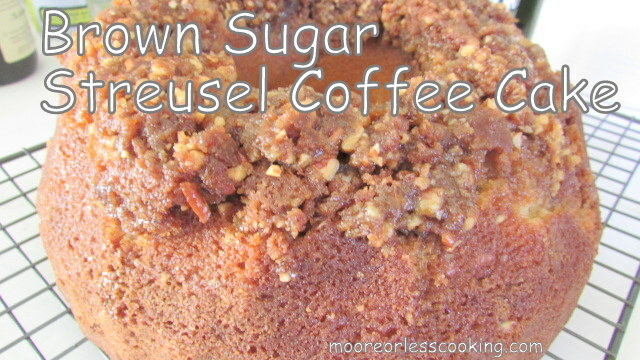 Your brown sugar streusel coffee cake looks so delicious. I’m sure my mom and dad who love coffee in all of its form will love this. I’m planning to surprise them with your coffee cake when I visit them this weekend. Thank you very much for sharing this lovely recipe! Sounds delicious! A great weekend treat! I made this today and was so happy! It looked great until 15 minutes later to flip over. I guess I didn’t bake long enough and it fell. I tested with a toothpick and it came out clean. It was yummy and and Im sure it would have been great if I cooked it longer. Make sure it is done…maybe 60 mins. Otherwise; it is an excellent recipe! Hi. Found your recipe via Pinterest. The cake is in the oven now. Looks delicious. Plan to share with my quilting guild tonight. I may try the blueberry coffe cake sometime too. Does this cake freeze well? I am a lover of coffee cakes and the streusel is my very favorite. I also love Maine and am sure it made for a beautiful wedding! Love old fashioned coffee cakes. I think it’s the topping that always gets me! Perfect! I’ve made this cake a few times and I always get great reviews!! Really easy and sooooo delicious!! I always add Heath Toffee bits to the brown sugar crumble for some extra sweetness and crunch!! I first had this coffee cake from a birthday breakfast at work… incredible! It is the best coffee cake I’ve ever had! The person who originally made it at work had accidentally substituted almond extract for the vanilla extract and it was also very delicious. Thank you again! !